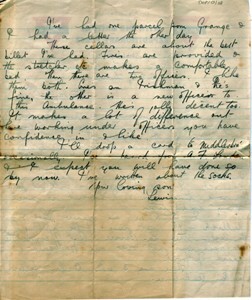 Letter from Lewis Lloyd to his Mother dated Saturday December 18th 1915. It is written on headed paper ‘Y.M.C.A. On Active Service WITH THE BRITISH EXPEDITIONARY FORCE’. 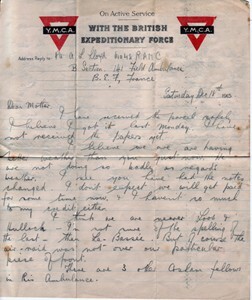 He talks about the weather and says he is near Loos and Hulloch; he mentions an air raid and talks about his billet. He also talks about his officers. 1 page. It also has the original envelope stamped ‘FIELD POST OFFICE 3 A 20 DEC 15’ and ‘PASSED BY CENSOR No. 2000’.